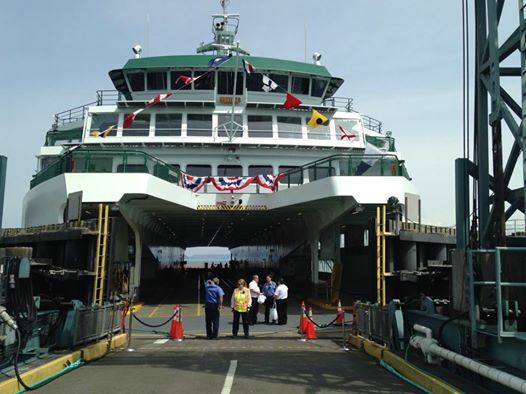 The ferry Sealth received the equivalent of Washington State Ferries’ Fleet Achievement Award as the most reliable boat in the fleet. The 34-yar-old vessel made 7,049 trips, ran for 3,522 hours and traveled 52,157 miles while missing only five trips because of mechanical failure. It beat out four ferries that didn’t lose a single trip to mechanical problems. The are the Chelan, Chetzemoka, Evergreen State and Hiyu. The latter two shouldn’t really count. The Evergreen State was supposed to be retired. It was needed as a backup boat, however, and ran more than expected but nowhere close to full time. I don’t remember the 34-car Hiyu ever leaving the dock. According to the Tri-City Herald, state Rep. Brad Klippert, R-Kennewick, wants no other flag besides the Stars and Stripes, the Washington state flag and maritime signal flags to fly on state ferries. Klippert has introduced a bill that would end the state ferry system’s practice of occasionally flying other flags. They have included “12” flags in support of the Seattle Seahawks and a rainbow-striped flag symbolizing gay pride. “I have no problem with the Seahawks flag,” he told the Herald on Wednesday. “People across all policy beliefs support our Seahawks, but that is not true for gay pride flags. Inslee will name the visiting crew members as Washingtonians of the Day. “From rescuing people in swamped kayaks and capsized sailboats, performing CPR on deck, to even delivering babies, these crew members go beyond the call of duty and sometimes risk their own lives to keep our citizens safe,” the governor’s office said. For the first time in its 30-year existence, Kitsap Transit will employ a public information officer. You might think that’s a big deal for me, a reporter. For you, not so much. Just the opposite. I go to the meetings. When I need to talk to somebody, I dial them up. That’s my job. Not being yours, you’re harder for the agency to reach. Even if you had time, you wouldn’t go to meetings. Transit needs to come up with other ways to engage you. Until now, tasks normally handled by a public information person were split up. They were considered “other duties as assigned,” said executive director John Clauson. That might have been reinforced when a survey last year revealed only a minority of Kitsapers knew about a cross-Sound ferry plan the agency had been working on for years. The going rate for a professional communications person starts at $88,000, as determined by a salary survey of like agencies, Clauson said. Intercity Transit in Olympia, a bit smaller than Kitsap Transit, starts at $75,000. Are they adding this position now to push the cross-Sound passenger-only ferry plan, you might wonder. It crossed my mind. The transit board will decide soon whether to ask voters to fund the service. If yes, they’ll choose whether to put it on the ballot in April or November. Upon further review, a PIO wouldn’t be plugging the plan. It’s not allowed. The prospective hire follows earlier marketing efforts that include a new logo and revamped website that’s more appealing and functional. Clauson holds quarterly community meetings. A website — www.kitsapferries.com ­— has been created to provide ferry plan information. Kitsap Transit plans to add two other new positions this year — operations supervisor and mechanic apprentice — and bump the ORCA coordinator from half time to full time. Transit board member Leslie Daugs of the Bremerton City Council asked during a budget briefing whether it’s a good idea to be adding positions with the “fiscal cliff” looming. That’s where revenues are estimated to increase 3.5 percent a year while expenses rise at a 5 percent rate. Kitsap Transit could be in a deficit position as early as 2019. Clauson said the deficit needs to be postponed through other means, such as replacing diesel buses with those that run on propane, which is cheaper. The fourth of this class of ferries — this is the Tokitae — could be named Suquamish. The Suquamish Tribe might have gotten a break in its quest to have a new ferry named after it. After Tribal Chairman Leonard Forsman’s pitch to the state Transportation Commission Tuesday, Transportation Chairwoman Anne Haley disclosed an affinity for the Suquamish. Her great aunt wrote a book in the 1930s about the Chief Seattle and Princess Angeline. She feels a “kinship” with the Suquamish because of that, she said. Forsman told her the book is rare and one of the better historic pieces about the tribe. During the presentation, he said the Suquamish, unlike many other tribes, lived along — and relied upon — marine waters. They rowed canoes back and forth across Puget Sound to fishing grounds. They helped early settlers get established. The town of Suquamish was among the first ferry terminals. An early private ferry was called Suquamish. Today, many Suquamish commuters rely on the ferries for their economic well-being, as well as social connections. Supporters of the other two names in the running — Sammamish and Cowlitz — will make presentations Wednesday. The commission is collecting opinions from two survey groups. Washington State Ferries personnel and the ferry advisory executive committee will chime in. The decision will be announced at the Transportation Commission’s March meeting. This is the fourth of four new Olympic-class ferries. The others are named Tokitae, Samish and Chimacum. With boats already named Salish and Samish, it could be fun to add Suquamish or Sammamish to the mix. 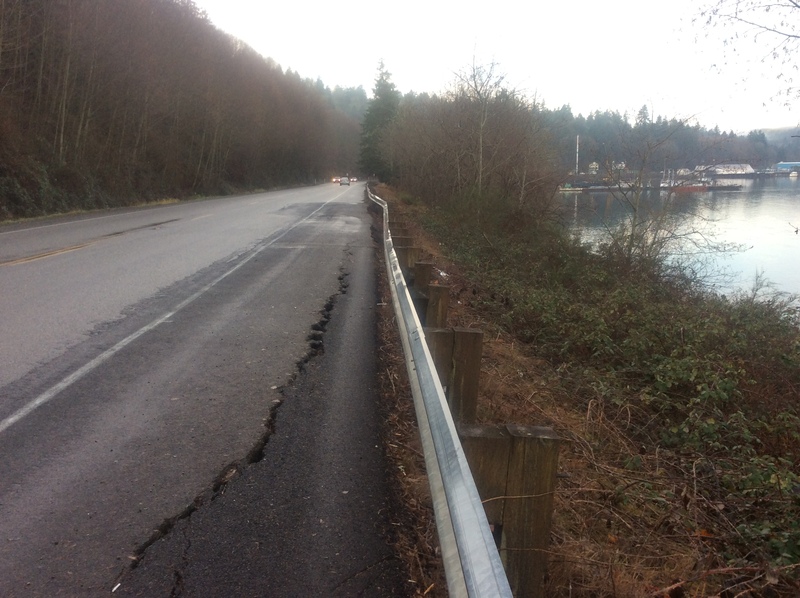 One of you readers mentioned in the comments to my Tracyton Beach Road story earlier this week that Highway 166, the road between Port Orchard and Gorst, is settling. I called WSDOT’s Claudia Bingham-Baker and she asked the maintenance crew to take a look at it. Here’s the photo they snapped. She says they’re aware of it and plan to level and patch the road this summer. I don’t know if this is related to the mudslides along there that would close the highway almost annually. It took several years, but the state seemed to get that under control. Washington State Ferries couldn’t leave New Year’s revelers at the dock. Overnight Thursday, more than 200 people arrived at Colman Dock after the last ferry had left for Bremerton at 12:50 a.m. They would’ve had to wait until the next boat at 6 a.m. or find another way, but WSF brought the boat back to Seattle and loaded the passengers at 3 a.m.